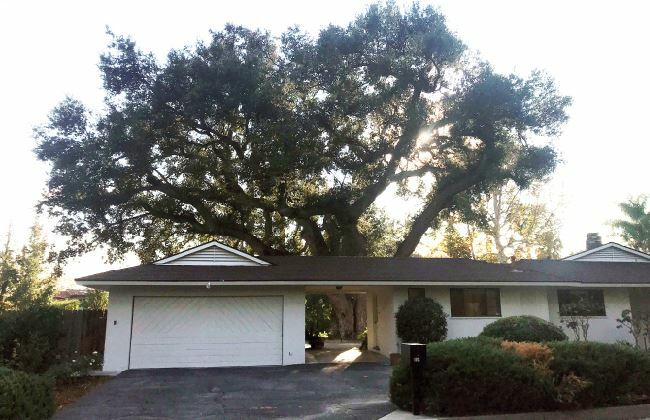 A city-protected coast live oak tree located in the backyard of the property at 650 Georgian Road was approved for removal in early November but two appeals of the action have been filed. An appeal hearing is scheduled for a Planning Commission meeting in mid-December or early January. The potential removal of an approximately 65-foot coast live oak tree at a La Cañada Flintridge residence has led to discussion of the importance of such trees to the city’s identity and an appeal of a decision in the matter. Resident Patricia Blanche, who objects to the tree’s removal, sees a bigger issue brewing in the city. Blanche added that most people who are new owners, like Frank, who currently lives in Glendale, have not grown up in LCF and don’t understand the importance of the trees to the quality of life and character of the community. “We are supposedly a Tree City USA, and while I appreciate that homeowners want flexibility to utilize the property they’ve spent a great deal to acquire, I cannot comprehend why people who don’t want to live under oaks move to a community heavily dominated by oak woodland,” Blanche said. According to Susan Koleda, the city’s director of community development, two people have appealed the permit. Blanche is not one of them. A protected tree is an oak or sycamore tree with a diameter of 12 inches or greater growing in a single-family residential zone, according to the city’s website. The Georgian Road tree is 72 inches in diameter “at breast height,” according to a city report. An arborist report by McKinley & Associates was received on Oct. 2 with an application that evaluated three protected trees on the property, according to the approval notice. Additionally, certified arborist James R. Smith submitted a letter on Oct. 1 saying he concurred with the report from William McKinley of the American Society of Consulting Arborists. Both arborists were hired by Frank. “The arborist explains that the subject oak tree is hazardous, in declining health (stressed and dying) and represents an unreasonable risk of injury,” according to the approval notice. Property owner Frank, who plans to move to LCF permanently, said the arborists he hired told him the tree needed to come down. “I think anybody at that point, even if they can appreciate how wonderful that tree is, their initial reaction is going to be if it’s dangerous I don’t have a choice,” Frank said. He added he is “totally handcuffed” by the city because of the tree. Koleda, in an email, said restitution for the unpermitted removal of a private protected tree ranges from $1,062 for lower-diameter trees to $10,800 for larger ones. Tree-removal permits are $291 per the City Council’s adopted schedule of fees, she said. She added no construction plans at the residence have been submitted at this time. Frank said he has heard rumors he plans to “build a big mansion” and destroy the tree. If the city wants him to plant new oak trees or contribute to a tree fund, he is more than willing to do so, he said. “But I think the lifespan for this particular tree is over,” Frank said. A woman walking near the house last week said she didn’t want to see the tree removed. Blanche would like to see more stringent rules in place for tree removal, such as the use of a neutral arborist — rather than one hired by a property owner, she said — and not charging neighbors who object to a removal to pay for an appeal in which they can’t inspect the tree. “The city has thus adopted a process that allows property owners to hire their own experts to make a finding that a tree needs to be removed, and places the onus for appeals on other citizens, who are ill-equipped and not reasonably empowered to provide them,” Blanche said. Fees for appeals are set by the City Council, Koleda said. She said fees are typically half the application fee plus the applicable public noticing fee. In this particular case, the appeal fee is $150, Koleda said. Koleda said accessing private property to inspect the tree without owner permission is trespassing. The city’s staff is required to conduct a site inspection for every tree removal permit, Koleda said. Most of the time, an arborist report is required to justify the removal of the tree based on the health and safety grounds, Koleda said. The appeal is scheduled for a hearing before the Planning Commission in December or January, Koleda said.